Since 1978, Frankfort Lions have collected thousands of used prescription eyeglasses in conjunction with local businesses that are "drop-off" points in order to give the gift of sight to those in need then delivered to the Lions of Illinois Foundation for distribution throughout the world. Special thanks to Frankfort Boy Scout Troop 270 for constructing eyeglass and hearing aid collection boxes in support of our commitment to serve as "Knights of the Blind." Used prescription eyeglasses and hearing aids may be dropped of at the following businesses in Frankfort and Frankfort Square. Leon Kosek, O.D. and Judith Walsh O.D. Dr. John J. Reilly, D.D.S. 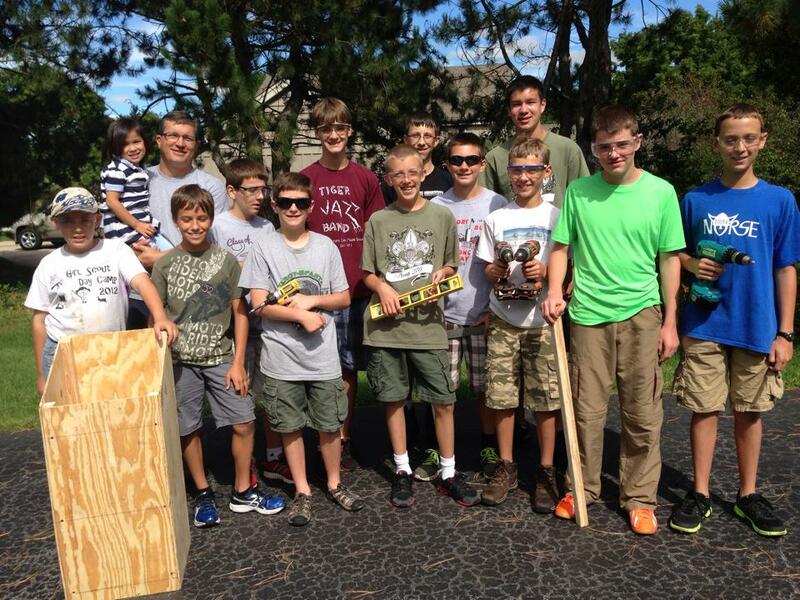 Frankfort Boy Scout Troop #270 taking a break from constructing an eyeglass and hearing aid donation box.